You can make numbers say whatever you want in real estate. Sometimes this happens on purpose, but other times it’s an accident. That’s why it’s so important to know how to make the right comparisons. Below I will show you an example of how you can look at the numbers and end up saying two completely different things about the market. Both might be technically true, yet one of the statements really doesn’t reflect the real trend. In an era of big data in real estate, knowing how to communicate these things to clients is key. Enjoy. When we compare January with December, it’s easy to get an inaccurate picture of the market (but it happens all the time in media outlets). In the case above, we see a 30% decline, and this sounds very alarming. Yet volume from December to January almost always decreases by 20-25% easily in any given year in Sacramento, so 30% in not something to freak out about. Truth: Comparing the previous month to the current month can sometimes give us the wrong picture about the market – especially in the midst of a strong seasonal trend. Volume is ALWAYS lower in January (see this quick graph as proof). 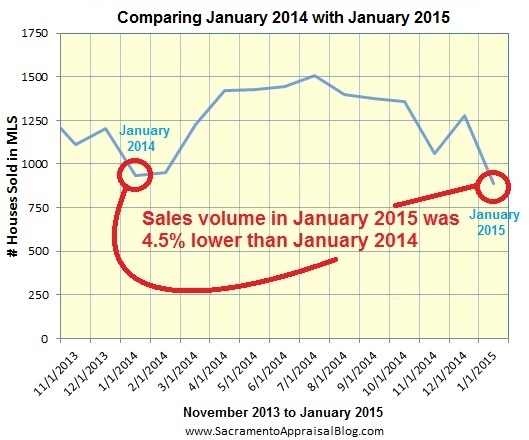 When we compare January 2015 with January 2014, we see sales volume was down by only 4.5% this year. That’s a far cry from sounding the alarm that “VOLUME IS DOWN BY 30%”. In this case the most accurate thing we can say about the market is that volume was 4.5% lower this January. Truth: Comparing the current month to the same month last year tends to give us important insight because we are using the same context for comparison. I’m not saying to not compare back-to-back months, but only to get in the habit of looking at the same month last year too. This is especially important when dealing with January and February data since they are typically slower months in terms of closed escrows. Remember too that last month’s sales tell us what the market used to be like when these properties went into contract 30-60+ days ago, but current listings and pendings tell us about the market right now. Questions: Any thoughts or insight? I’d love to hear your take.